Note: All of the commands in Wiring Tools are electronics related. Don’t use a wire when you just need to draw a line, shape or an arrow: use Drawing Tools instead. There are three ways to enter the wire mode in EasyEDA. 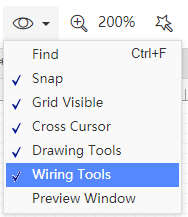 Click the Wire button from the Wiring Tools palette. 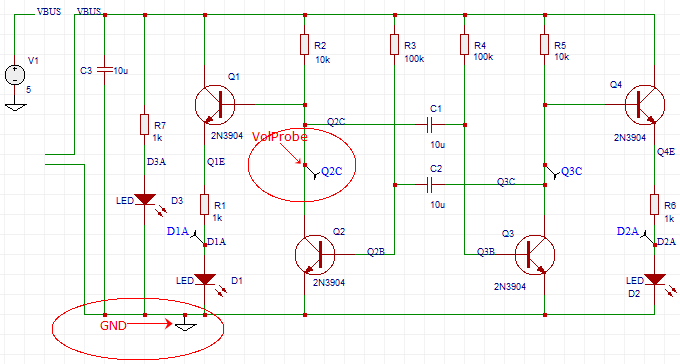 EasyEDA automatically enters Wire mode. If you place a component, such as a resistor, on top of a wire then the wire breaks and reconnects to the ends of the component. When moving selected components using the mouse, they will drag attached wires with them (“rubber band”) to some extent but please be aware that the rubber banding feature has some limitations. When moving selected components most wire will move vertically and horizontally. Using the arrow keys will not rubber band. Selected wires do not rubber band. A selected wire can be moved directly by clicking on it using the mouse or by the arrow keys. If a wire is selected by clicking on it using the mouse then green grab handles will appear at the ends and vertices. When you want to wiring a series of resistors which are in a row, you can just wire through them, and then you will find they all be connected. 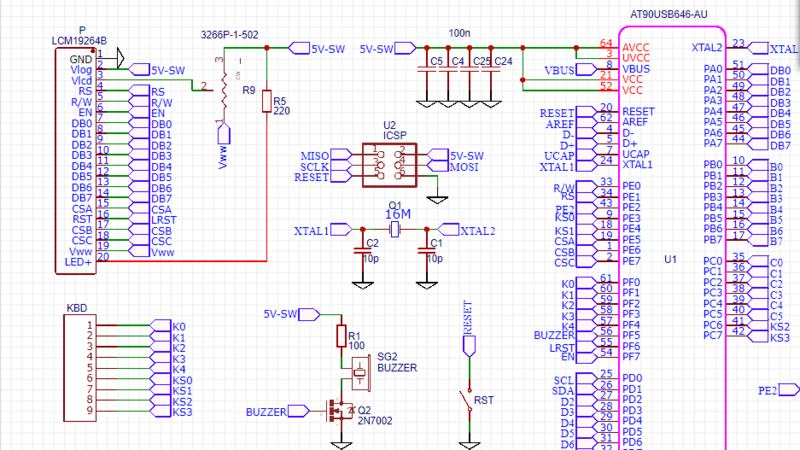 When you design a professional schematic, perhaps it will use a lot of wires. If you’re wiring one by one, much time would be wasted, and then you need to use Bus. 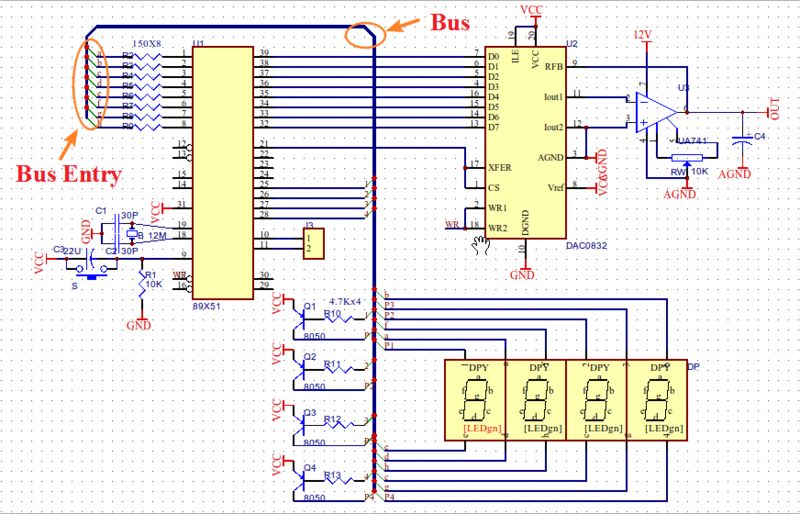 If you decide to wire with Bus , the Bus Entry must connect to Bus and other nets with wires. such as in the above image. The “Bus” and “Bus Entry” just for the indication, because when you place Bus and Bus Entry, you have to place the netlabel on the Bus Entry dot point. You can change its name and colour. If you only want to change its name, it may be easier to just double click the netlabel. EasyEDA support mutil-netlabel in one wire now. When you convert the schematic to the PCB, the editor will choose the first netlabel you placed as the net name for this wire, as below NETLABEL1. As above image, when you click anyone netlabel’s name in the design manager, the wire will be highlighted. If wire 1 has 3 netlabels A B and C, and wire 2 has netlabel A, then wire 1 and wire 2 are the same net. This schematic is almost finished. Wiring Tools palette provides NetFlag: Digital GND, Analog GND, VCC and +5V for your convenience. 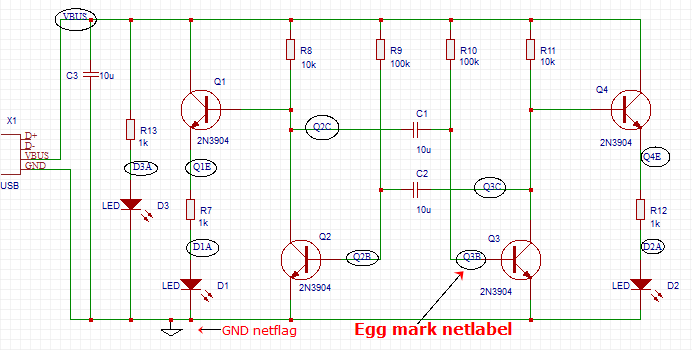 It will make your schematic look more clean, and you just need to set each Net Port a net name. In the below schematic, if you don’t add a NO Connect Flag, there is an error flag in the nets collection of the design manager. After adding a NO Connect Flag, the error disappears. Note: NO Connect Flag only works on the symbol’s pin directly. 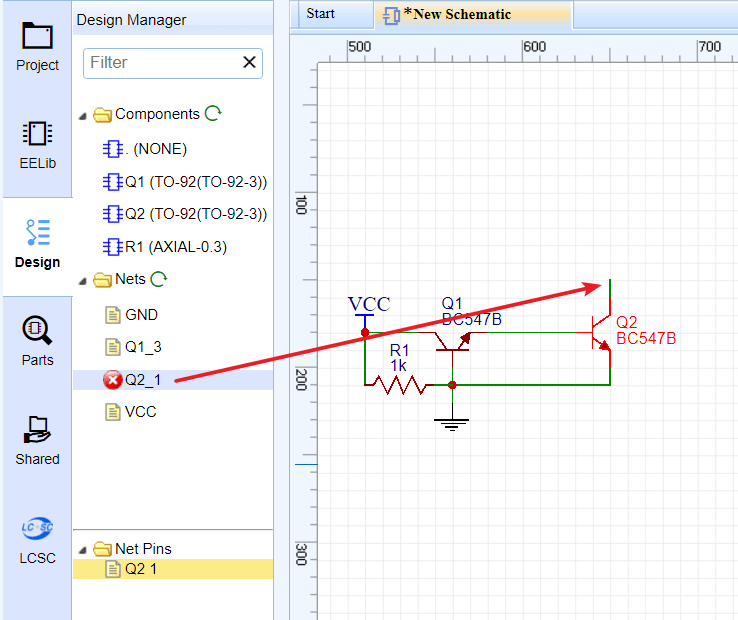 EasyEDA provides a simulation feature for the schematic. After the simulation is running, you will see the waveform where you placed the voltage probes in the circuit. For more detail about the simulation, please check the Simulation section. 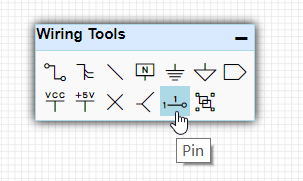 When you create a new symbol in schematic and schematic lib, you must use Pin to create pins for the new symbol, otherwise your symbol can’t be wired with wires. For more information please refer to the Schematic Lib: Pin section. Just like the Symbol Wizard, this tool is also for you to quickly create schematic library symbols. Using the Symbol Wizard you can only create generic symbols but how can you quickly and easily create symbols like these? EasyEDA allows you to do something that very few other EAD tools support. 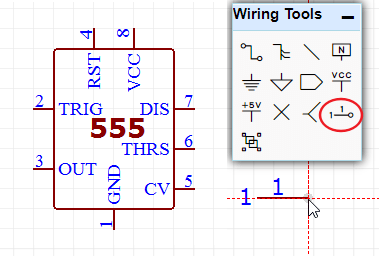 Using the group function, you can create any symbol in the schematic, easily and quickly. So what does Ungroup do? Try selecting a symbol and then click the Group/ungroup command to see what happens! 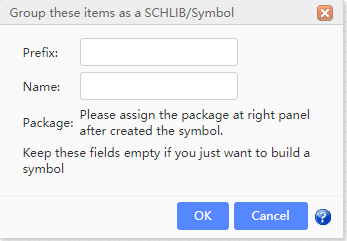 The symbol you created in the schematic will not be save in the personal libraries, if you want to use it repeated, please create a schematicLib.